Forensic Laboratory: The Laboratory is staffed with scientists who employ both chemical and instrumental techniques to conduct analysis in the areas of controlled substances identification, serology, and fire debris analysis. Personnel are certified by the American Board of Criminalistics. 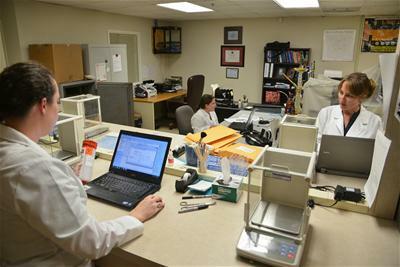 Crime Scene: The Crime Scene Unit is responsible for the identification, documentation, and collection of all evidence at crime scenes in the City of Charleston. Personnel are trained in photography, videography, recovery of foot/tire impressions, blood spatter interpretation and trajectory analysis. The unit also uses powder and chemical techniques to recover fingerprints from items of evidence and restore serial numbers that have been partially obliterated. Personnel are certified by the International Association for Identification. Latent Prints: Latent examiners manually compare fingerprints recovered from crime scenes to those of suspects and victims of crime. The Unit also has an Automated Fingerprint Identification System (AFIS) that permits the examiners to search unidentified latent prints against a database of fingerprint records maintained by the South Carolina Law Enforcement Division. Personnel are certified latent examiners by the International Association for Identification. Photography Unit: The Photography Unit supports and facilitates all the photographic, computer graphic, video and image enhancement needs of the Charleston Police Department. Staff photographers also work to record the history of the police department and the City of Charleston. Polygraph Unit: The polygraph examiner combines interview and interrogation techniques with the data recorded by an instrument that measures physiological reactions to draw conclusions about a person’s truthfulness. This information is used by the Charleston Police Department for criminal investigations, internal affairs matters and pre-employment screening. Digital Evidence: The Digital Evidence Unit is responsible for the examination of digital media of any kind including computers, cell phones, pagers and peripheral storage devices. The Digital Evidence Unit was the first municipal laboratory to achieve ASCLD/LAB - International accreditation in digital examinations.